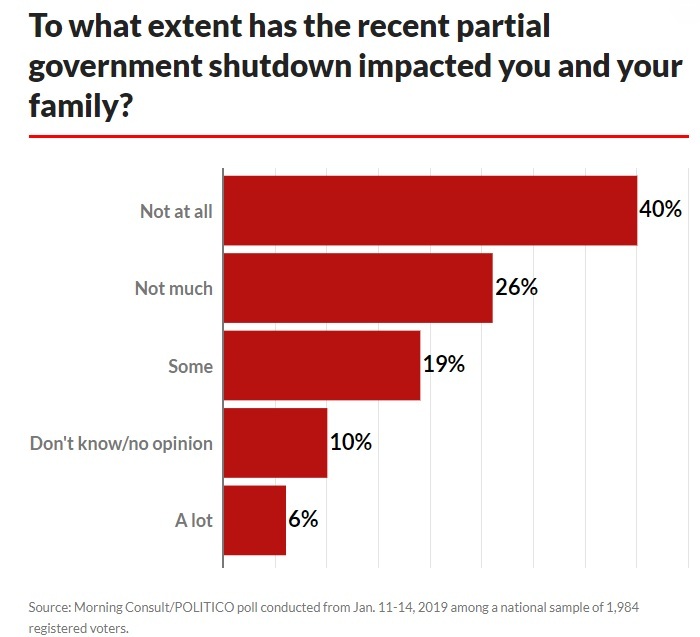 I cared a lot about the 1995-96 shutdown and the 2013 shutdown because those were battles involving the size and scope of government. But I don’t have a dog in the current fight over immigration and border security. That being said, I told Neil Cavuto that there are several fiscal policy lessons we can learn from the current shutdown fight. A short TV interview just scratches the surface of an issue, so here are some additional details. 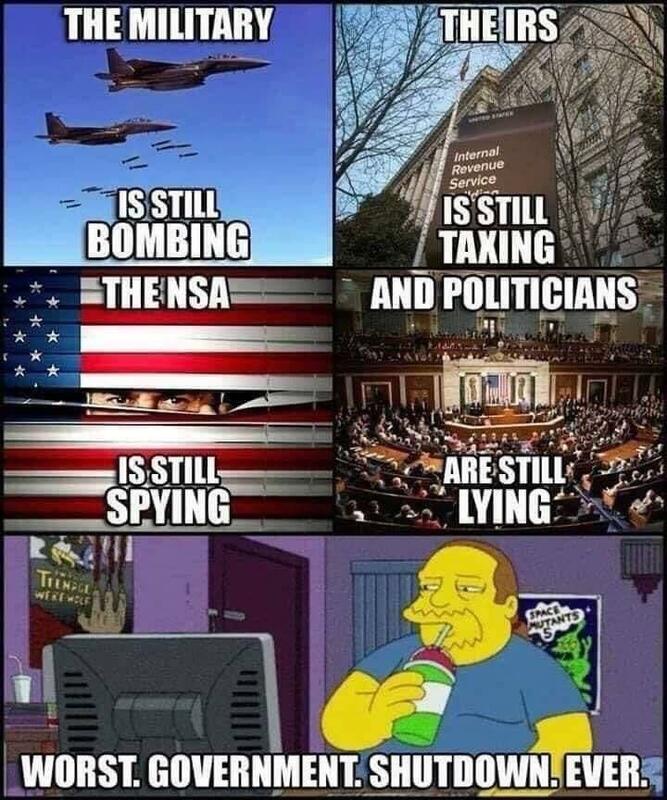 The first lesson is that much of what the government does is irrelevant to America. I pointed out that ordinary Americans don’t notice or care that departments such as Housing and Urban Development are closed because there’s no net value generated by such bureaucracies. And polling data supports my assertion. The second lesson is that some parts of government should be shut down permanently. If people don’t care or notice that a department is temporarily closed, they probably won’t care or notice if it is permanently closed. I think that message applies to bureaucracies that are affected by the current shutdown (such as HUD and Transportation) as well as to some of the bureaucracies that are unaffected (Education, Energy, Agriculture, etc). The third lesson is that temporary shutdowns are not a money-saving exercise. A shutdown does not alter the amount of entitlement spending and it does not change annually appropriated spending. And since bureaucrats always get back pay for their involuntary vacations, there aren’t any savings there, either. Some argue (see here and here) that a shutdown gives the executive branch unilateral authority to save money. I actually hope that’s true, but I have very little reason to think the Trump Administration is interested in fiscal rectitude. The fourth lesson is that a busy and productive Congress is a dangerous Congress. I included the brief blurb by Senator Tillis prior to my interview because I don’t want a “productive” Congress. I’m not being nihilistic. Instead, I’m making the simple point that America’s Founders had the right idea in creating a factionalism-based system that enables gridlock. Last but not least, the fifth lesson is that bureaucrats should have less power over economic activity. I mentioned that there wouldn’t be any threat of disrupted air travel if all airports got to use a privatized version of TSA. But that’s just one small example. Tim Carney’s column in the Washington Examiner is a must-read on the issue of pointless bureaucratic impediments to commerce. …the government shutdown is another lesson… Before now, if an out of state brewery issued a new seasonal, you could simply purchase it across state lines thanks to…Form 5100.31 approvals… Of course, if you’re a particularly skeptical type, you may have a question… Why in the world should a brewer need federal approval on new beer labels? Once we ask that question, a thousand analogous questions come to mind. And in the asking, we expose the trick in so many stories about the crucial work of our expansive federal government. The trick is that the government’s work is often made necessary only by needless federal meddling in the first place. …when some reporter tries to tell you to be grateful that the federal government is opening a gate for you, ask them why the wall is there in the first place. This is what I was trying to get across in the interview about business decisions being stymied until some bureaucrats signs off. Let’s wrap up today’s column with a superb Reason video by John Stossel. P.S. No column on this topic would be complete without adding to our collection of shutdown humor (h/t: Libertarian Reddit). You can see other examples of shutdown satire by clicking here, here, here, and here. If the furloughed people are non-essential, why were they hired in the first place? My wife voiced concerns that without 800k people spending money, the economy would suffer. I pointed out that those 800k people’s jobs were a burden on the economy and it would actually do better without them. What I mean by that is with that many less people finding ways to fine, regulate and tax the private side of our economy, there would be a net positive. I’d like to see your comments to that effect in a future column. Dan, I love you and respect you as a sincere lover of liberty, but, you’re one hell of an idiot if you don’t see the connection between the size and scope of government and the invasion of socialist savages from all the shithole socialist countries. We have plenty of domestic socialists already, we don’t need millions more. All your wishing and hoping for Libertarianism must come to naught if immigration continues the way the psychotic megalomaniacal Globalists are doing it to us now.